Designated for configuring the Syncrify server. The user ID for this user is always admin. This account cannot be used to run backups. Additionally, by default you cannot connect from any other machine but the machine where Syncrify is installed on. You must use admin (lowercase) to connect as administrator. Administrator must create one or more backup user account using the web interface. These accounts use email address to identify a user and is used to run backups. When you connect to the web interface using these accounts, you cannot change any configuration on the server. A common mistake users make is that they do not use admin for user ID when connecting as administrator. See image on the left. Click to enlarge. What if I forget the password for admin? You cannot restore the password for the admin account using the forgot password link. Contact our support@synametrics.com if you want to reset password for the admin account. Could not login to admin account after initial installation (v3.5 build 778), but I fixed the issue by editing "umap.dat" in "config" folder on server (in my case "/opt/Syncrify/config/umap.dat") and replaced "localhost" with "". After restarting Syncrify admin login proceeded normally from remote workstation (on same LAN). 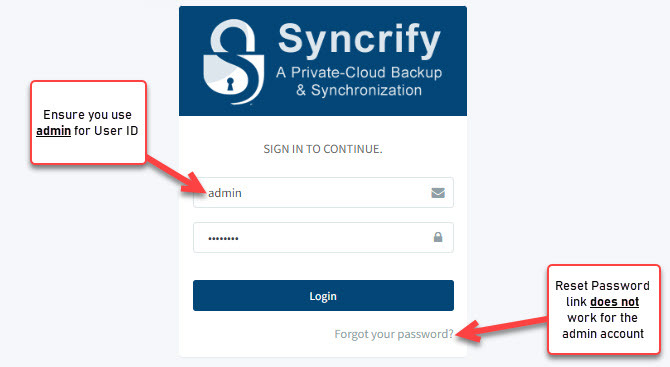 After upgrading to Syncrify to Version: 3.4 - build 725 I could not login to the server using the admin account. I had always logged on from a local workstation to the web app on the backup server. The problem was not a lost or forgotten password but a change made to the settings during the upgrade. The software is installed on a headless server without any web browser software. As part of the upgrade the security feature "allow admin from localhost only" was turned on, blocking admin access from the my workstation. The warning in the web page was "incorrect user/password" - some notification "admin allowed only on localhost" would have helped. Solution: I had to add a web browser to the backup server to remove the "localhost only" setting.